Protests in Guatemala City on November 16, 2017. Accessed from Truthout.org. Written by Michelle Gomez – this post is part of a 3 part series on best practices of SDGs worldwide. The Open Government Partnership is a worldwide initiative that was created to ‘promote transparency, empower citizens, fight corruption, and harness new technologies to strengthen government.’ It ‘aims to secure concrete commitments from governments’ and encourages governments to draft action plans and to reflect on their progress every few years. Guatemala has been notorious for rampant corruption within government and the elite throughout history, and especially in the reign of the most recent presidents. However, the state demonstrated that they are trying to combat this issue when they joined the Open Government Partnership in 2011. Since joining, Guatemala has has created 22 commitments. They have been assessed as completing 63% of their commitments. Part of this partnership encourages civil society organizations, members of the private sector, academia, and public entities to join in on the implementation of the OGP plans. Getting as many outside actors and organizations as possible involved in the decision-making process is essential to government transparency and the fight against corruption. On September 2nd 2015, President Otto Pérez Molina resigned amid corruption scandals; he was arrested the next day facing charges of fraud, accepting bribes, and illegal associations and he is currently facing trial. The Guatemalan public along with CACIF (their chamber of commerce, industry, agriculture, and finance) had been pushing for this all Summer. Although this was considered a great victory in the fight towards transparency, there was still a long way to go. Since this scandal, Guatemala has continued to see multiple high-level government officials outed publicly with charges of corruption in recent years. Not only this, but many of them have immunity from having to go to trial and being penalized. Jimmy Morales, who followed Molina in office after the scandal, has also been suspected of corruption with his campaign funds in 2015. In September 2017, he was granted immunity by Congress after an investigation began on him and his family. Furthermore, Congress elected several individuals linked to corruption as their leaders. 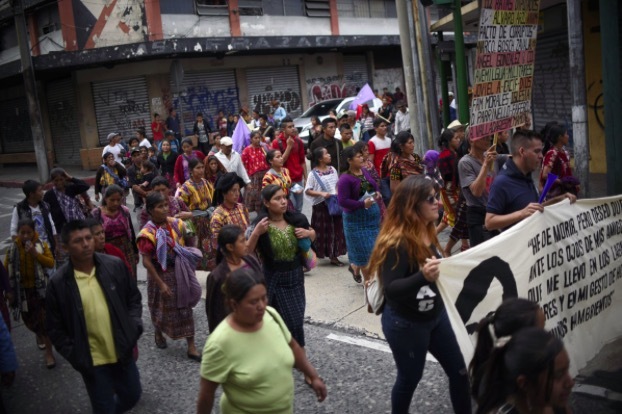 In these turbulent times, it is even more essential that civil society and other external organizations put pressure on the Guatemalan government to address these issues. In joining the Open Government Partnership, the first steps towards transparency have been taken. In the fight to eliminate corruption and create transparency, Guatemala is working toward SDGs #5 Gender Equality, #16 Peace Justice and Strong Institutions, and # 17 Partnership for the Goals. The involvement of civil society organizations as well as representatives of all levels of government ensures that government decisions are accounted for and allows the general public to have their ideas and needs represented. Allotting a specific budget for the SDGs and allowing civil society to have a formally recognized say on how it is spent is an excellent step in the right direction. Furthermore, combating corruption ensures that government funds are spent as they are meant to, thus indirectly working toward many other SDGs. Despite the long history of corruption in Guatemala, individuals and organizations have had enough and are finally using the tools they have to put pressure on the government to change. All it took was engaged civil society groups, budget reallocation, and a few passionate and honest government officials to demand change.